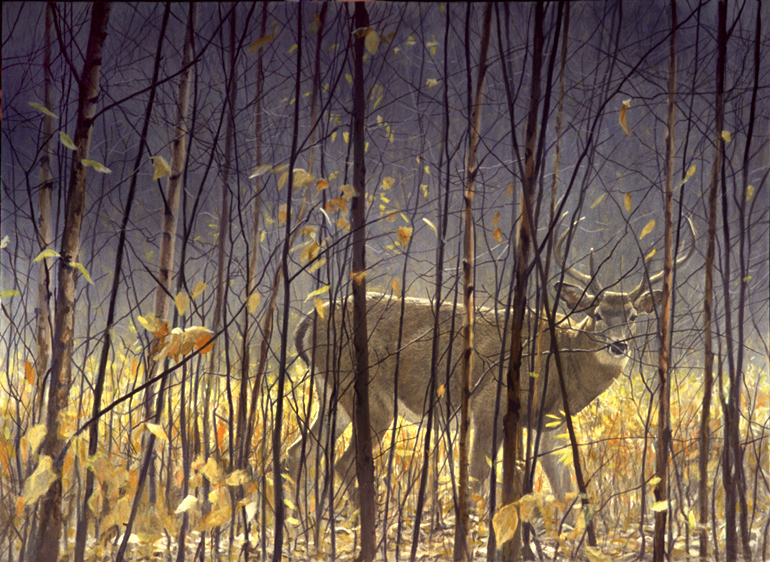 This white-tailed buck, moving behind the slender trunks of birch trees, sighted you long before you spotted him. I know a lot of people might ask, "Why paint a nice deer and then put all those branches in front of it?" but that is how you see them in the wild. I also like the veiled effect of the delicate verticals of the birches before the deeper horizontal planes of the painting. In Through the Birches, I tried to create the illusion of a screen of tree trunks, branches, twigs, leaves and grasses, allowing the eye of the viewer to discover this handsome whitetail.